Manipur People’s Party (MPP), one of the oldest regional party in the entire north-eastern region has announced to field their candidates for the two parliamentary seats in the upcoming Lok Sabha election in Manipur which is expected to be held early 2019. 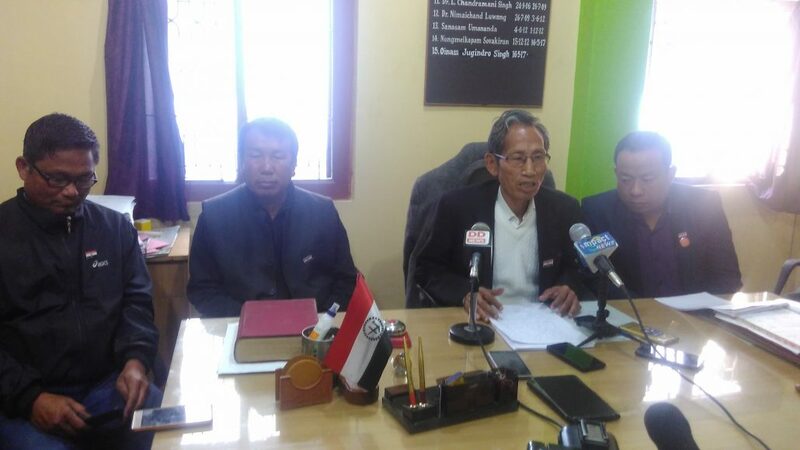 MPP President Oinam Jugindro Singh accompanied by vice president Ibomcha and general secretary (administration) made the announcement during a press conference at their party office at Mapal Kangjeibung in the heart of Imphal city on Saturday. The decision to contest in the Lok Sabha election was taken during the meeting of party’s central committee which was attended by almost all the committee members, Jugindro said adding that the committee favours contesting in the election as part of strengthening the party. Because being a popular regional party which has formed governments in three different intervals in the state, the new executive of the party is now taking necessary steps to revive the party, he added. The party had formed government in 1972, 1974 and 1990 in Manipur and ruled the State for more than 35 months and taken up various public important development programmes apart from instituting certain acts and regulations. In 2007 Assembly elections, five MLAs were elected on MPP tickets. Since then the party could not produce its representative in the 60-member Manipur Legislative Assembly. As a result, the party’s symbol has been frozen and de-recognized by the Election Commission of India, the MPP president felt. But now with the initiative of the new functionaries of the party with the help of party workers across the state will work hard to win the upcoming elections including the Lok Sabha polls. So the names of the candidates for the Lok Sabha polls will be declared without delay once the election committee of the party takes a decision within a shortest possible time, Jugindro admitted. Regarding the recent claims by an individual that the party will not contest in the upcoming Lok Sabha polls, the general secretary(administration) of the party said the individual(M Totomshana Nongshaba of Heirok constituency under Thoubal district) who made the claim has been suspended from the primary membership of the party for six years for his anti party activities.